Last weekend my cable went out. Just mine, not my neighbors’. The cable company said it would be a week before they made it out, so I resigned myself to a week without internet access, television, or the stupor-inducing soundscapes radio channel. And while I am very happy to be reconnected, it was actually a really peaceful week. Not to mention incredibly productive. In addition to successfully scrubbing my house from top to bottom, and unsuccessfully attempting to wash the outside windows with the mop while hanging over my balcony (seriously, don’t try that at home), I also managed to get quite a few of my WIPs going again. 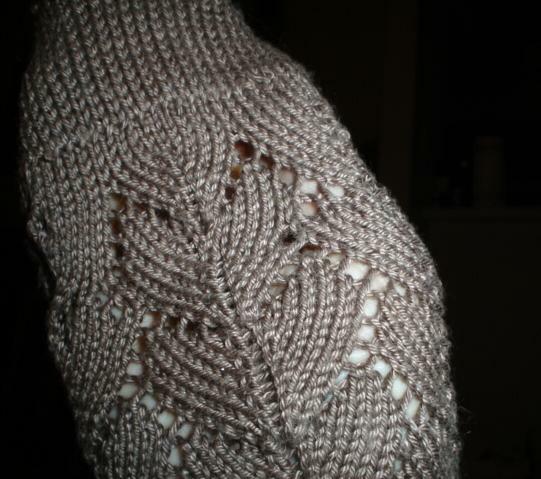 First, the leaf cardigan is being generously given to my mother, since it’s too large for me. All edges picoted and just awaiting the I-cord. Will wait until my internet goes out again for that one. 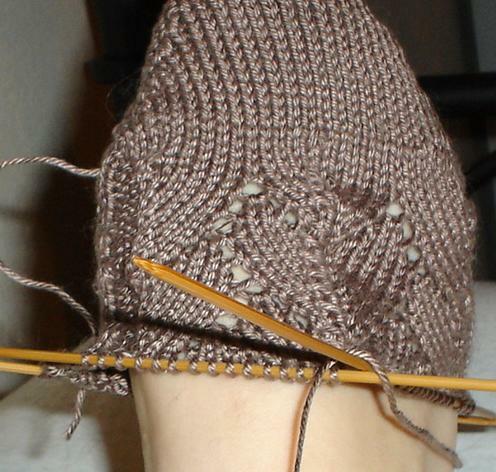 I also taught myself how to knit socks. I never understood the feverish obsession with sock making. I mean, they’re just socks, right? But I get it now and am one with the sock borg. Spring Grass Socks – A toe appears! And a few nights later, it was a sock. A proper sock, with a heel and everything. Now that I know how to do it, I can lose the ugly brown waste yarn and get started on the gorgeous watercolor colorway of Lorna’s Laces Shepherd Sock. I haven’t even finished this pair and I’m already wondering what these would look like in a very fine lace-weight yarn, made into stockings rather than socks. Am also attempting to draft a pattern to duplicate a scarf I fell in love with at Anthropologie. 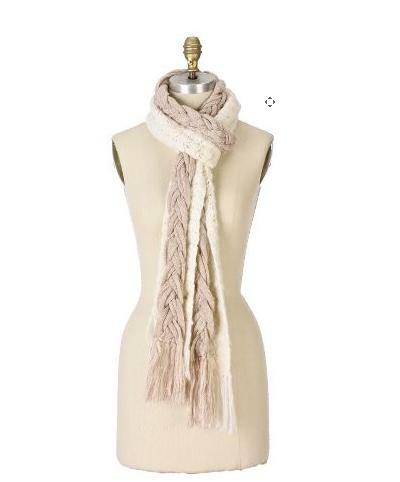 My friend Molly pointed out that the scarf would actually be less expensive to buy than to knit myself, but I’m not convinced. I’ve got the white background of the scarf down – it’s just any sort of eyelet. It’s the braid that’s confounding me. Any ideas? And in case I didn’t have enough things to do in my knitting queue, I fell in love with Dashing after seeing all the beautiful variations on Ravelry. I know a few people who would love these for a Christmas present. Socks and scarves and mittens, oh my. You’d almost think it was autumn. I also finally started painting frames while watching Ken Burns’s The War tonight. They still need a clear coat, and the first needs another coat of blue, but I’m pleased with how the first two came out. Hedgehog Girl from The Black Apple, and the gorgeous sketch of The Dormouse from Alice in Wonderland is from Phantomwise. Oh, man, is your apartment gorgeous. I am so hiring you and Phantomwise to help me make my flat look great after I move next year. painting frames for that mysterious place you claim is your home? Socks! Ah ha ha, you’ll never look back. 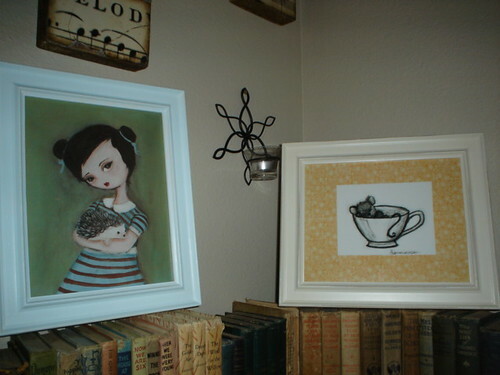 The picture frames are loooovely. As is that scarf — the braidy bit looks, erm, braided rather than knitted.